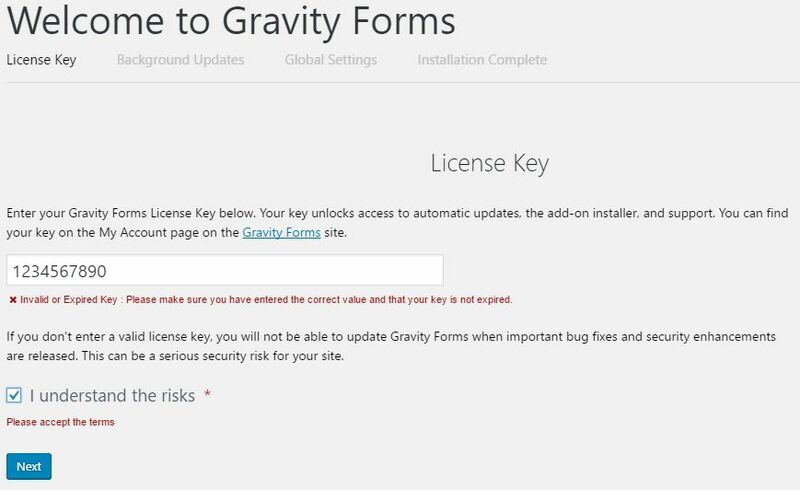 When you first install & activate Gravity Forms it will ask you for a license key. You do not need a license key to use the Gravity Forms software, the license is for software updates and support direct from Rocket Genius, the developers of Gravity Forms. We cannot provide you with a Gravity Forms license key for updates but as an alternative we provide software updates via our own WP Toolkit plugin. We cannot provide support for the third-party plugins we supply. To begin using the Gravity Forms plugin you can enter any series of digits (e.g. 1234567890) into the license key field. A message will say that your license key is expired and you will need to check the "I understand the risks" box to continue. Continue through the remaining setup pages and Gravity Forms will work as usual.